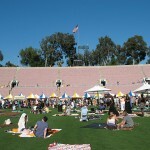 Plenty of room on the Rose Bowl field during the early part of the 2010 Summer Tasting Event. Organizers have greatly expanded the amount of space for this year's edition. Often imitated but never duplicated, the LA Street Food Fest returns with its 2nd Annual Summer Tasting Event, taking place once again at the Rose Bowl on Saturday, July 16th. 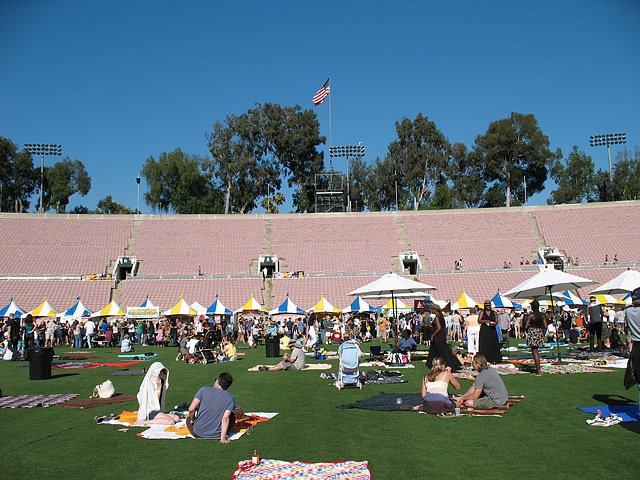 Everything about this year’s edition of the festival has been expanded, from the number of participants to the event space, which now includes three soccer fields in the Rose Bowl’s Brookside Park. With plenty of room and staggered event times (see below), Co-Founders Shawna Dawson and Sonja Rasula hope to mitigate the long lines and food shortages that affected the latter part of last year’s Summer Tasting Event. The list of participants features dozens of the city’s favorite gourmet trucks, old school carts and stands, celebrity chefs, and some of LA’s top restaurants. Vendors include food trucks like The Grilled Cheese Truck and Great Balls on Tires, street eats by foodie faves Starry Kitchen and Guelaguetza, and one of Food & Wine’s 2011 Best New Chefs, Ricardo Zarate (Picca, Mo-Chica). Bill Esparza (Street Gourmet LA) has helped to assemble a first-ever gathering of legendary Baja chefs, including Javier Plascencia and the chef widely acknowledged to have the best street cart in the world: Diego Hernandez of Corazon de Tierra. The always-popular Ice Cream Social makes a welcome return, featuring cult favorites CoolHaus, Master Chef’s Batch from Scratch, and a preview of the upcoming Mother Moo Creamery. 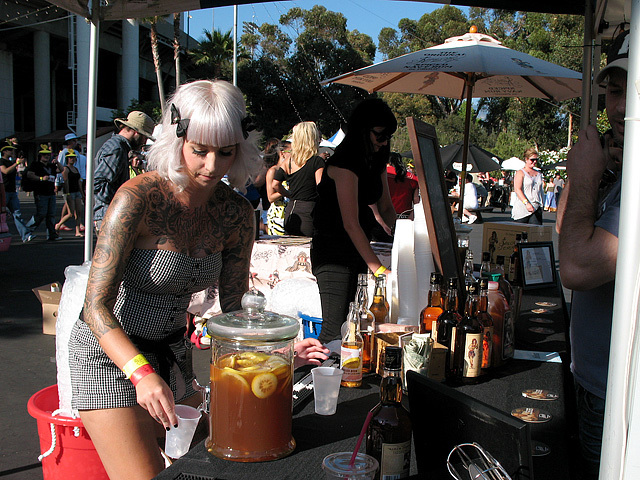 The Sailor Jerry station is sure to be a popular stop again this year. Sampling all that great food is thirsty work, so the Summer Tasting Event will have two Singha Beer Gardens, plus cocktail bars featuring Sailor Jerry Rum, Milagro Tequila and Hendrick’s Gin. 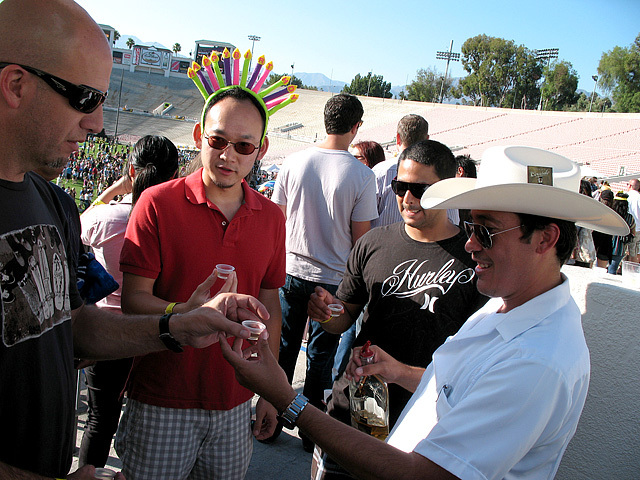 Tequila Corrido makes it a very happy birthday at the 2010 Summer Tasting. No word yet on what Starry Kitchen's Nguyen Tran will be wearing at this year's festival. NOTE: only 200 Luxe Lounge tickets are available per session. Family Pack tickets start at $130 for 2 Adults and 1 Junior (ages 8-12) for Session I or II. Online tickets are on sale now at Eventbrite. No tickets will be sold at the door. A portion of every ticket sold will benefit the Downtown Women’s Center to support its mission “to provide permanent supportive housing and a safe and healthy community fostering dignity, respect, and personal stability, and to advocate ending homelessness for women.” In 2010 the LA Street Food Fest raised over $10,000 for St. Vincent Meals on Wheels and Woolly School Gardens. Children age 7 and under are admitted free with a paying adult to Session I or II. Due to health and Rose Bowl regulations, no dogs allowed. Sorry, Snoopy. Update 7/12: For those of you lucky enough to have Luxe Lounge tickets, here are the cocktails by Julian Cox! For more information on the LA Street Food Fest, visit lastreetfoodfest.com.